How do you think? I have found this question demands more than a cursory consideration as we pursue truth in our faith. How I thought 10 years ago was distinct from and derogatory to my current pattern of thought. I was 19, in my first year of university and convinced that who I am today in my Christian beliefs would be nothing short of heretical. So why the shift in attitude? When I began university I decided, as many do, to follow the latest Christian trend at the time. I decided to become a Calvinist. Now, to borrow a phrase from C.S. Lewis, I did not become a Calvinist like some “topsy-turvy turnip” sprouting without particular reasoning. The theology of Calvinism offered something I found wonderfully attractive. It offered absolutes. I grew up hearing a tale about a footbridge Isaac Newton built over a stream in Cambridge. The story goes that the bridge required no nuts or bolts. Its pieces were assembled just so as to allow the bridge to function using friction alone. In the modern era (read somewhere between the 1800s-1960), a group of eager students decided it would be a lark to take this bridge apart to see how it worked. No sooner had they begun examining it did they learn that they couldn’t work out how to reassemble it. And so it had to be reassembled using nuts and bolts to hold it in place. While the bridge story proved untrue, the concept seemed valid as I observed Christianity. It seemed as though Christianity had been disassembled and analyzed and when “they” were done, they had forgotten how to put it back together. And so people settled on the idea that God himself is relative. “You believe your thing, I’ll believe mine,” became the popular mantra. I balked at this concept and found myself unsettled by the idea that my faith might be open to this kind of relativism. 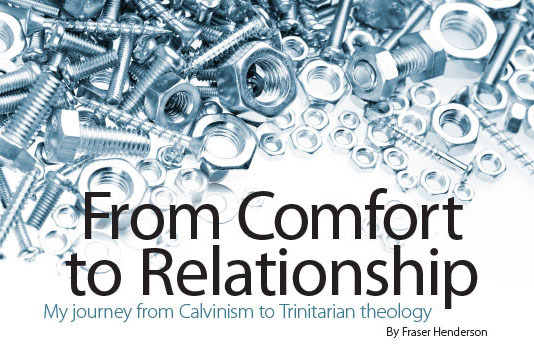 Calvinism is at its heart a theology of galvanized absolutes. There’s no room for doubt within its understanding of God’s unassailable sovereignty. From before he began his creative work, Calvinist theology holds, God not only foreknew and predetermined who would be the recipients of his grace, he actively worked to create some of mankind for the sole purpose of salvation and some for the sole purpose of damnation—a process in which we human beings have no effective input. At first this gives the believer many assurances. It establishes that God is in control. It also argues that good is defined by him, so any act he takes in his sovereignty is by his virtue, which is always good. It’s an attractive theological position, and you might be asking why I changed. As I studied theology at the university, I started to find some answers to the question I asked at the beginning. How do I think? The answer is, we primarily think according to our tradition of teaching. One of the primary reasons that Calvin phrased his view of God’s sovereignty in such a stark and unrelenting manner is because he was taught to reason that way. Western thought has been predominantly shaped by the thoughts of one admittedly great thinker, Aristotle. Aristotle gave us the language of logic we use today. Before Jesus was born, Aristotle proposed the idea that God, should he exist, must be an “unmoved mover.” This being would have to be wholly disconnected from creation, yet creation must be entirely dependent on him. There could be no concept of a personal God in Aristotle’s mind because God must be so completely “other” than us. Included in Aristotle’s theology is the idea that God would have to be impassible, i.e. unable to be affected by anything else. It is this concept of God that drives the Calvinist viewpoint, and it was that realization that made me want to re-examine my position. Does a God who allowed himself to be crucified truly resemble this God that Calvinists worship? I realized that if I were going to accept the good news that Jesus Christ is God, I also had to accept that God was not the impassible, unmoved mover of Aristotle’s theology. Or I had to argue that Jesus, though he was flogged, wasn’t affected by it, never felt pain? He surely did; Scripture bears witness to it. In Exodus God famously declared to Moses, “I am who I am,” and in so doing he declared that not even our greatest philosopher would be capable of defining him. Yet I had found in the Calvinist position a declaration to God of who he is, not a declaration from God to humanity. So the question I had to ask myself is: what was it that God was declaring to us about himself? I have come to believe that Scripture reveals to us a God who is not impassible, which is his active choice. God did not just allow himself to be nailed to the cross; it was the manner in which he actively chose to reveal his redeeming love to us. 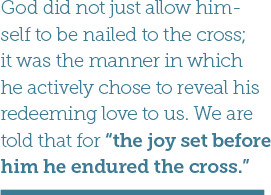 We are told that for “the joy set before him he endured the cross” (Hebrews 12:2). He is a God who feels, relates, loves—he is Incarnational. Though he could have chosen to be the “unmoved mover,” that’s not who he is; he chose to be involved in his creation. So though we would certainly say that before the foundation of the world he knew and chose those who would be saved, we also say that he did this not as the unmoved mover, not as the one distant and arbitrary in his decisions, but rather as one who planned to prepare a method to extend his grace and salvation to all. In his sovereignty he is not constrained by the narrow scope of the Aristotelian and Calvinist God who is apparently limited from the outset by his inability to reconcile a world in which he permits people to freely choose or deny him. Rather he exercises his complete freedom of sovereignty to confer upon humanity the freedom to choose him and participate in who he is. In the Calvinist, non-Calvinist debate we are given, in my view, two choices. We can choose to define who God is based upon the thoughts of a long dead philosopher. Or, to once more paraphrase C.S. Lewis’ words, we can allow the one who is so full of life that he had to borrow death just to die (and even then death couldn’t handle him) to define himself. In the one view we stand on the sidelines and observe, and though we might find this comfortable, we are but automatons, devoid of the image of God. In the other, the Great I Am can lead us in the person of his Son who has redeemed the image of God within us and brought us into the loving relationship of his triune nature. It is there, in the presence of who he is, that we learn who we are to be.